This element is never found free in nature. 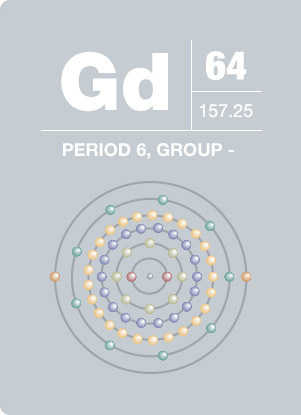 Unlike its rare earth counterparts, gadolinium is relatively stable in dry air. It is soluble in dilute acid. At room temperature, it is strongly magnetic and is the only metal exhibiting ferromagnetic properties aside from the fourth period transition metals. Gadolinium’s compounds are used for making phosphors for color TV tubes and solutions of its compounds are used as intravenous contrasts to enhance magnetic resonance imaging (MRI) for medical patients. While it has no known biological role, it is said to stimulate metabolism.